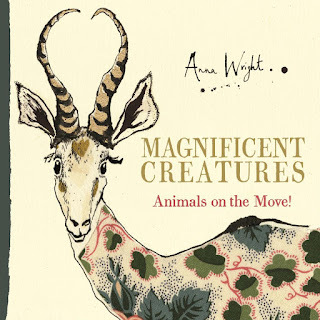 Kids' Book Review: Review: Magnificent Creatures: Animals on the Move! Review: Magnificent Creatures: Animals on the Move! From turtles to zebras, herring to firelies, jellyfish to snow geese, and more, the amazing Anna Wright has captured nature at its most fascinating in this truly beautiful book! Each two-page spread focuses on an animal that is known in some way for its remarkable 'movement'. So, the South African springbok is featured for its startling ability to jump vertically up to 4 metres in height with all four legs extended — a technique known as pronking. Snow geese spend half their year migrating in a disciplined V-formation to and from their winter and summer resting spots. Herring are notable for their synchronised schooling of up to 3 billion fish at a time (and yes, that's billion not million!). Springbok, snow geese, herring: very different kinds of movement but all equally incredible! A brief paragraph gives key information about the animal and the reason for its selection. The rest of the spread is then dedicated to Anna Wright's gloriously quirky illustrations — a combination of pen and ink, watercolour, and fabric collage. I think the zebras are my favourite: as well as conventional black-and-white striped ones rendered in pen and ink, Wright has used fabric to create a zebra with dalmatian-like black spots and even one with a chequerboard pattern! Not only is this book a gentle introduction to some intriguing animal facts, it's also a visual delight that could easily be used to inspire some crafty collage-style activities at home and in the classroom. Title: Magnificent Creatures: Animals on the Move!